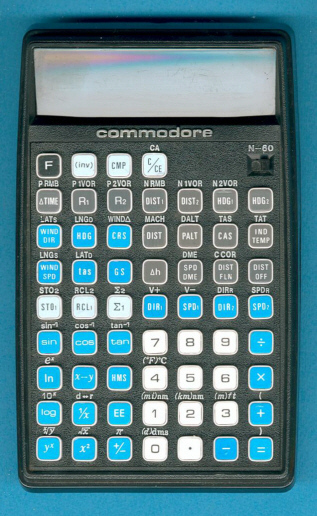 Size: 6.3" x 4.1" x 1.4"
The Commodore N 60 aka Navigator counts a total of 60 keys. Using the housing of the Scientifical / Statistical calculator S-61 the Navigator is a strong Air Navigation Computer. If we trace back in the history of electronic flight computers we discover: This Commodore N 60, the Heathkit OCW-1401, the navtronic 16 and the Texas Instruments TI-58 (with installed Aviation Modul). The N 60 is featured in the Commodore Business Machines, Inc. leaflet C76 dated 1976.